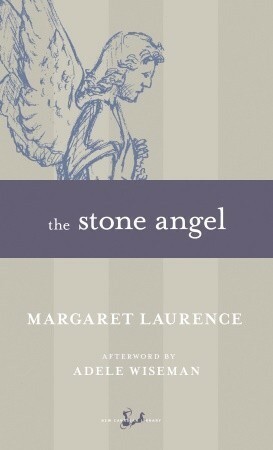 I have been meaning to read The Stone Angel for a long time. Reaching letter ‘L’ in my A-Z CanLit Challenge was the perfect chance to finally do it. It was a delight to finally get to know Hagar Shipley. Not that she is a delight. In fact, she is snarky and cantankerous, but that’s part of what I like about her. Basically, this book is about a bitter, proud old woman who, long ago, gets married to spite her friend and her father, and ends up paying for it for the rest of her life. We get to hear all of her bitter thoughts and memories (peppered with cynicism and sarcasm) as she looks back on her long life, and as she deals with the realities of her old age. I am past ninety, and this figure seems somehow arbitrary and impossible, for when I look in my mirror and beyond the changing shell that houses me, I see the eyes of Hagar Currie, the same dark eyes as when I first began to remember and to notice myself. I can’t change what’s happened to me in my life, or make what’s not occurred take place. But I can’t say I like it, or accept it, or believe it’s for the best. I don’t and never shall, not even if I’m damned for it. For 17 years, Hagar has been living with her son and daughter-in-law, who themselves are starting to feel their age. They have been accommodating and have done their best, while putting up with her abusive and cross remarks. As she doles out her bitterness, she finds herself wishing she wouldn’t. As she remembers the past, she finds herself wishing that she’d done some things differently. Many times over in her life, her pride has been her downfall. Every good joy I might have held, in my man or any child of mine or even the plain light of morning, of walking the earth, all were forced to a standstill of some brake of proper appearances- oh, proper to whom? When did I ever speak the heart’s truth? Pride was my wilderness, and the demon that led me there was fear. I was alone, never anything else, and never free, for I carried my chains within me, and they spread out from me and shackled all I touched. What makes this book exceptional is that it is so human. We have all made mistakes that we regret, we have all said things that we wish we hadn’t, we have all been too quick to judge, too proud to admit our faults. We are all getting older whether we like it or not. Many of us are married and work hard at it, many of us have been married and couldn’t continue, many of us have had a child and have experienced the many emotions that go along with being a mother, many of us wonder what will become of us when we are too old to take care of ourselves. We want to remain independent, but we don’t want to be a burden. We want to be remembered fondly and be missed, rather than be remembered as an inconvenience. We want to be able to look back and know that our lives have mattered, that we have left something meaningful behind. Okay, you get the idea. This book is relatable on so many levels, even if you are not anything like Hagar. I got so much out of this book, and there are so many passages I made note of, too many to share them all. There are many things I feel like I have left out; the laugh-out-loud moments when reading about a woman whose thoughts are not kept secret from us, the feelings of powerlessness she must have felt in her current situation, the moments of wisdom she shares with us, the way she is herself until the very end. Her story is moving, insightful, and deeply human, and leaves all of us feeling richer and wiser for having read it. The door to my room has no lock. They say it is because I might get taken ill in the night… So they may enter my room any time they choose. Privacy is a privilege not granted to the aged or the young. Sometimes very young children can look at the old, and a look passes between them, conspiratorial, sly and knowing. Hagar: “Yes. Yes, it was.” But only because it cannot be otherwise, at whatever time. I do not say this to Mr. Troy, who likes to think that half a century makes all the difference in the world. How it irks me to have to take her hand, allow her to pull my dress over my head, undo my corsets and strip them off my, and have her see my blue veined swollen flesh and the hairy triangle that still proclaims with lunatic insistence a non-existent womanhood. I’d be the last one to maintain that marriages are made in heaven, unless, as I’ve sometimes thought, the idea is to see what will happen, put this or that unlikely pair together, observe how they spar. Otherwise, now. Why should He care who mates or parts? But when a man and woman live in a house, sleep in a bed, have meals and children, you can’t always part them by willing it so. Bless me or not, Lord, just as You please, for I’ll not beg. 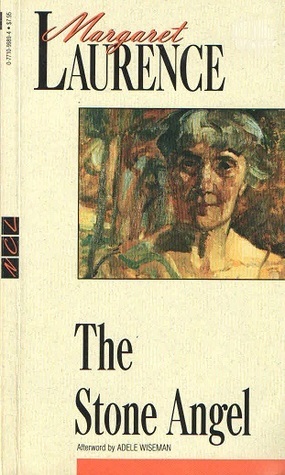 In the Afterword, written by Adele Wiseman (a novelist and friend of Margaret Laurence), we find out that Margaret Laurence was hesitant to write a book about an old lady. She didn’t think anyone would want to read it. …Then this daft old lady came along, and I will say about her that she is one hell of an old lady, a real tartar. She’s crabby, snobbish, difficult, proud as Lucifer for no reason, a trial to her family, etc… The whole thing is nuts- I should have my head examined. Who wants to read about an old lady who is not the common public concept of what an old lady should be? Obviously, no one… But I can’t help it, Adele. I have to go on and write it. … the old lady, in her continuous monologue, discovers herself, carves out and completes the shape of her own life, comes fully alive at last before she dies. Do not go gentle into that good night/Rage, rage against the dying of the light. Now I’m kind of glad that I waited this long to read The Stone Angel. I’m pretty sure I would have liked it when I was younger, but I might not have seen the brilliance of it. Have you read any other Laurence? I must admit that The Stone Angel isn’t my favorite of hers. We had to read it in highschool and I think it is a tale suited to an older audience. I love The Diviners though. Brilliant writer. The Diviners is the only other one I have read, but I read it a long time ago, and didn’t like it as much. Ha! Either we have different tastes in her books, or both books should be read by an older audience. Maybe I should give The Diviners another try! Love the review! I have this one on my shelf, and it sounds fantastic. Glad you liked it! Thanks! I hope you like it, too! I could do that already, too, which I think is one of the reasons I liked the book so much. Maybe it will be even better in another 20 years! i think I was supposed to read this in university and never did. Your post is kind of making me regret that – my goal in life is to become a cranky old woman. Not sure I could have appreciated it when I was 20 though so maybe this is something to look forward to. It might be a good thing you haven’t read it yet – it was for me. Something to look forward to! Love the sound of this novel. Never read Margaret Laurence -great review. I think I will have to check this out at some point! I haven’t read any Margaret Laurence, but I’ve had The Diviners on my list of things to read. I think I’ll add this too. The quotes you highlighted sound very insightful. The book is full of great quotes- if only I could share them all! I had trouble narrowing it down, and I still included too much. I think I will have to re-read The Diviners sometime- it’s been about 20 years since I read it. Like you, I really liked this book and I was in my early 20’s when I read it. I still have that copy and probably should reread it (45 years later). I too was not too fond of The Diviners, and didn’t keep it! 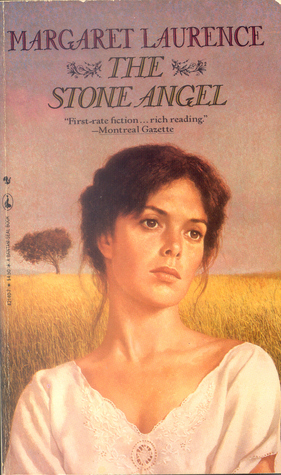 If you decide to re-read The Stone Angel after 45 years, let me know how it compares to the last time you read it- I would love to know! Wow, another book about aging. Is there any kind of message that says don’t freak out? I think I need to read a book like that and Etta and Otto didn’t do the trick. 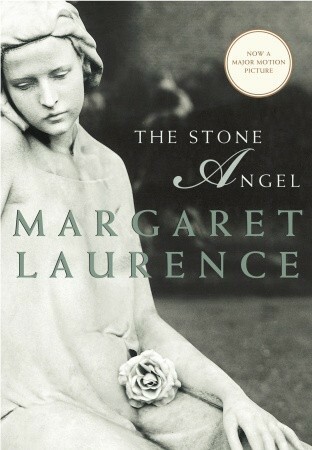 I started reading The Stone Angel last year, but ran out of time and had to return it to the library. Thanks for the great review and reminder to get the book again. And the Birds Rained Down was the nicest one I’ve read so far about old people not freaking out about dying, but just enjoying life day by day. It really lifted my spirits. I really appreciate May Sarton’s approach to changes in life and aging in particular; her diaries have been favourites for me since I was about 20 years old and even though I think, every time I pick one up, that they might lose their magic for me, they remain solid and sustaining. I haven’t read anything by her – I will have to check her out! Thanks! Thanks for reminding me of this fine Canadian classic. It must be forty years since I’ve read it. I’ve often thought of rereading it. After your thorough review I don’t need to, at least not soon. I’m glad you enjoyed it. You must have read it soon after it was written. It’s a classic now, but do you remember how it was thought of when it came out? Not at all. I think it was for a university class but I’m not sure. It was a long time ago. Is this considered the quintessential Canadian novel? My husband talks about it from his school days. I am a new person to Canada — the past 5 years — so I need to check out the best of the best. Liking the CanLit … cheers. I don’t know about the quintessential novel, but it is definitely considered a Canadian classic. 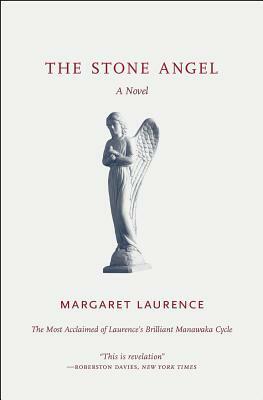 You could try anything by Margaret Laurence, but The Stone Angel is a good one! Thanks for visiting my blog, and for your interest in CanLit! I was an odd teenager; I loved this book despite an exhaustive treatment of it in the twelfth grade. 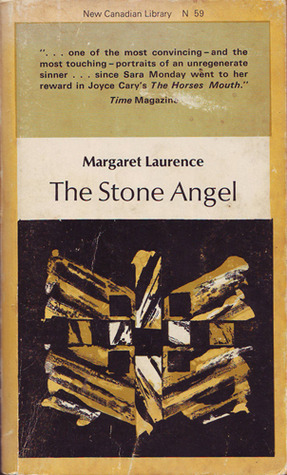 And Margaret Laurence was technically the first of my MustReadEverything authors, beginning with Stone Angel, but then I panicked after reading all the novels and I saved some short stories (little did I know then that rereading would be just as satisfying). I love that you included so many quotes, so that those who haven’t met Hagar on the page, yet, will get a sense of her spiritedness and wicked wit (among other qualities). Have you considered watching the film? I avoided it for ages, fearing nobody could “get it” on screen, but it’s quite wonderful in its own way (IMO). I didn’t know there was a film! Now, I am curious about it, but I can see why you’d be wary of it. It would be hard to make a film true to the book and Hagar’s character. Quotes are always the best way to give people an idea of the character/writing. I love quotes. Which Margaret Laurence book would you recommend next? Thanks for the link! And, I think you are right about The Diviners – I read it a long time ago. Wonderful review. I can’t recall where first heard about this book, but it has cropped up a couple of times this year. Great commentary on the novel’s themes. It seems as if there is a sense of universality to Hagar’s story, she could represent any one of us. It’s true – none of us may be exactly like her, but all of us have experienced at least one or more of the same things she has experienced in her life. And, most of us are someday going to be old, looking back on our past, while needing help whether we like it or not. She was just such an interesting character. I think you would like her!